Why Your Grandparents Didn’t Have Food Allergies…But You Do - ShareIt! It is a fact that the growing epidemic of food allergies is worsening with every generation. 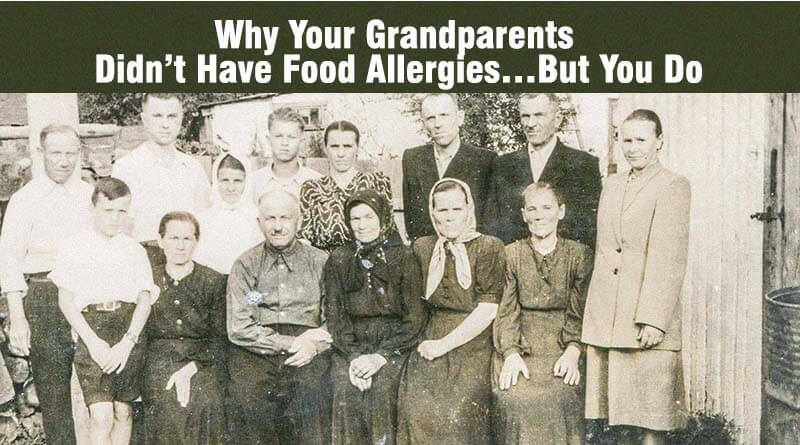 In other words, our grandparents didn’t have any food allergies, while we do. Why is that so? In the 1900s, the food was fresh and preservative-free as it came from farms and small markets. Their diets were abundant in nutrients due to the lack of processed foods, allowing them to get the most of the food they consume. Needless to say, babies were fed on breast milk. Given the fact that marketing didn’t exist back then, our grandparents were not victims of the food marketing, calorie counting, fad diets, and other harmful dietary habits. They ate based on their needs and cravings, which allowed them to have a healthy metabolism. Eating out was considered luxury and buying processed food was definitely not an option! Our grandparents cooked home at home, using traditional and healthy methods. Back in the 1900s, food was not treated with GMO, hormones, stabilizer, antibiotics, or food additives, all of which are detriment to the person`s health. Organ meats were often present at the table and animal bones were made into delicious broth and soups. They ate the whole animal and appreciated these foods for their medicinal properties. The food they consumed was their only medicine! They trusted the natural healing process of the body and whenever they had a fever or flu, addressed them by eating soup and broths. The doctor visits were rare and only in cases of an emergency. Ultimately, our grandparents used to spend a lot of time outside. Instead of staying inside, as we do, they were playing outside, riding a bike, swaying on the swing-sets, etc. Every cell in our body is affected by nutrition and cells` health heavily depends on our diet and lifestyle. Given the fact that cells create tissues, tissues crate organs, and organs create a system of organs, poor nutrition affects the whole body and the overall health suffers, making us more sensitive to some foods.